New To The Saltwater Aquarium Hobby This forum is a friendly place for all the people that are new to the saltwater hobby to post their questions. This section makes it quick and easy to find useful information for beginners and get answers to your questions. First of all, hi to all. I'm very new to this, so please bear with me. So I have just been quoted a long list of equipment by one of the local shops, which I am seeing as slightly overkill. Could someone give me a hint if this is any good or not. lighting - tube - marine 36"
lighting - tube - blue moon 36"
lighting tube - marine 18"
lighting tube - blue moon 18"
they are telling you you need all that for a 63 gallon tank? these guys are out of their mind. Do yourself a favor and read some posts on this forum about filtration and lighting and do a little homework before you go believing everything your LFS tells you. If your a newbie a tank of that size might not be good for you. You dont wanna waste money on equiptment and fish only to have them die. Start out with something smaller and less complex. Learn the ins and outs of building a good ecosystem in your tank and keeping the correct water peramaters. Regarding size of tank its not realy something with options, if I go smaller now, I wont be able to go larger then. So.. what should I shoot of the list? I would stay with the size tank you have picked out or go even larger if you can. I would never use a Cannister filter instead go with a Sump/Fuge. I wouldnt waste my time with an air driven PS instead go with a small cone skimmer. You dont need air pumps. Get a refractometer instead of Hydrometer. I would get your tank drilled for over flow and return and if needed you can run your chiller off the return I believe. You will need 2-3 nice power heads like the Koralia's or Tunze's for circulation because you dont want all your flow from the return. Just remember the larger the tank to a point the easier it will be to keep the water parameters stable, I always recomend 55-90 for a first time SW setup. For a fish tank you don't need all the equipment. Here's what I would to. 1) use play sand. 50 pounds cost $3 or so. 2) mix crushed oyster shells with the sand. 3) use porus landscape rocks for decorations. Some even used to make structures by siliconing together lava type rocks. 4) use the short side for a refugium and grow plant like macro algaes there such as the various caulerpas and perhaps shaving brushes or mermaid fans. with egg crate (1/4" square plastic grid light diffusers) as a partition to keep the fish in the long side. 5) light the refugium side with spiral compact flourescent lights in round spot reflectors. 6) add a few powerheads for circulation. set it up with the macros but no fish for a week. then add 4-5 male mollys and not add food for a week. Then start feeding a couple of flakes per day. then at about 3 weeks start adding the true marine fish. But that's just what I would do. And it's worth .02 max. Oh yea, the main idea of above is to first establish the plant life and then do the rest. Hope that didn't get lost in all the details. Archer: I realy cant go any bigger, well maybe just a little deeper if i mange but nothing seriouse. So, if I go sump instead of cannisters, what size requirment would I be looking at? Beaselbob: As previously said, I just might be able to add some depth but deffinitely not lenght. The quoted sand is not that expensive, so I might aswell go with it. I would not be very keen to partinioning the aquarium, since this way I would block fish out of the most visible are of the aquarium. Thanks all for the info, I shall be in contact with the shop, and see what they say. Keep them coming if you have something else to point out. When setting up a sump/fuge you will want to go with as big of a tank as you can fit under your tank inside your stand. The reason I dont like cannister filters is they need to be cleaned on a regular schedual because any mechanical filter will trap fish waste and food and they will break down into nitrates then unless cleaned they will continue to produce nitrates. 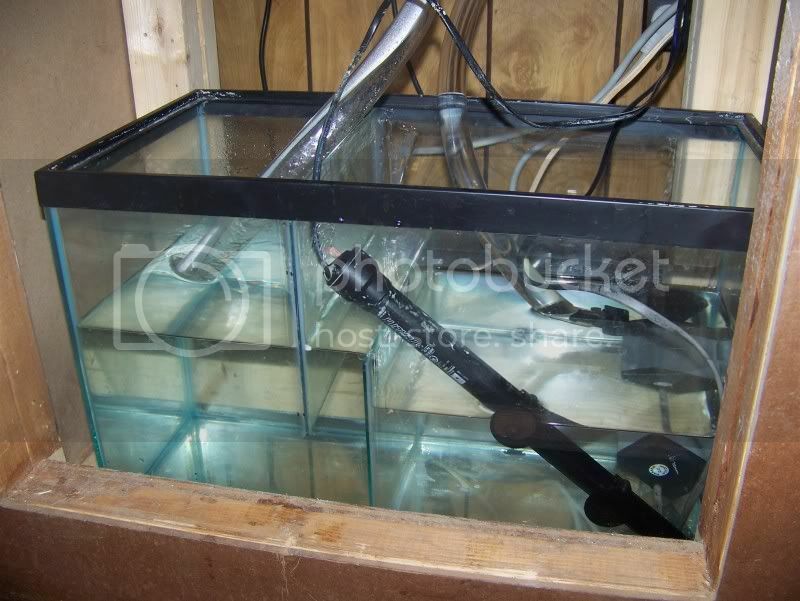 The sump/fuge doesnt really need to be cleaned once running properly and thats just a matter of getting macro algeas growing and having your protien skimmer running and then all you need to do is clean the skimmer cup and remove some macro algea when it fills the fuge section. 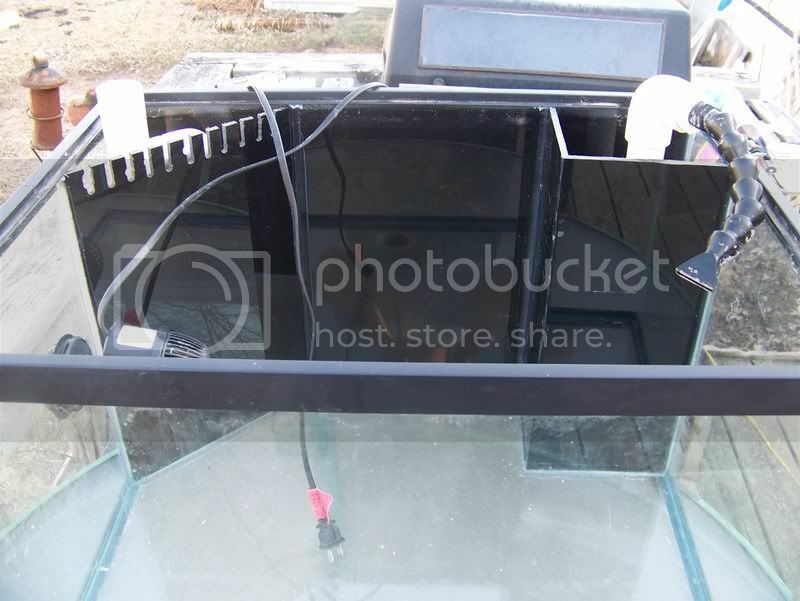 The sump/fuge will give you a place to dose, top off, put your heater and that way you wont see any water level fluctuations in the display and you could also add a ATO (automatic top off) and run it to the sump. Always keep in consideration that a noob is speaking..... but wont the sump being under the main aquarium make it easy for gravity to have its impact. Im assuming here, you get water by gravity to the sump, and back to the aquarium by pump. what happens if the pump fails? You end up emptying the aquarium in the sump (and on the floor)? Ok, and as big as possible but will something around 1/4 of the main aquarium do? Thats about all I have space for. OK lets see if I can make this easy to understand oh and I had problems understanding until I saw one in action. When you drill a tank it will be done on the back glass or the bottom, when done on the bottom there will be stand pipes installed and those are just PVC pipe glued into the bulkheads and then a front cover with notches cut into the top for the water to over flow and then go down the PVC. The water in your display can only go down as far as the notches in the cover plate and that would only be about 1 inch on the average and the overflow can only take as much water as the pump puts back into the aquarium. The overflow cant loose syphon with a power outage so no need to worry about that and as long as there is enough room in the sump it cant overflow that way either. This is my tank that was drilled on the back glass near the bottom but it gives you an idea on what I am talking about I hope. That sure helps archer, in my case I will have to find a way to get the supply/drain tubing from the sides and not the back. It might be a little problem since if you have a look at the aquarium drawing the sides are back to back with stone (which im thinking of making hollow to store the equipment / sump in ). Re lighting I havnt got a clue, it was never stated in the quote. below please find the prices ,about skimmer i have written 2 models to choose from,and about lightning depanding on what your going to use! if your going to use metal halide i can have them with 150.00 euro each ,buti can give you good discount on them! This is what another shop just quoted me. 1/10 of the price, but no chiller and lighting. 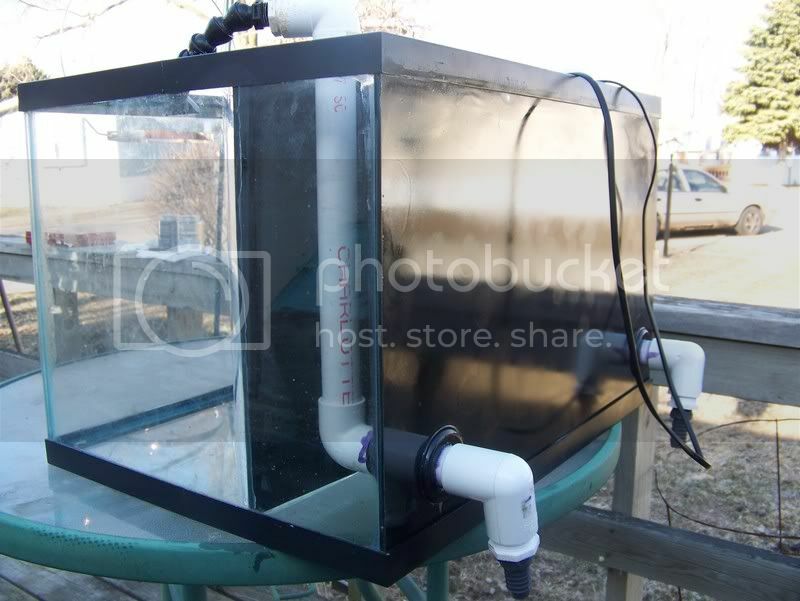 Well if you are having this tank built for you then figure out where the sump/fuge will be located and have the bottom drilled and then just have holes put int the stand that way you wont see any of it except for the cover. I would go with T-5 lighting incase you go with corals or are going to be adding corals. The nice thing with having a tank custom built is you can get everything done the way you want shape, size and overflows. Ammount of light is this realy neccessary? Almost 20ft of lighting.